3552 Don Quixote... leaving our solar system?  In this case it is Asteroid 3552 Don Quixote  one of the most well-known of Near Earth Asteroids. You may know its name, but did you know it has possible cometary origin? It may very well be one of the Jupiter-Family Comets just waiting for its turn to be ejected from our own solar system. Asteroid 3552 Don Quixote was discovered by Paul Wild, on September 26, 1983 and has recently been part of a study where it has been virtually cloned one hundred times into hypothetical asteroids to further understand orbital evolution of bodies of its type. It is commonly assumed that NEAs like Quixote may have originated from a parent body between Mars and Jupiter, where they smashed into existence due to the larger planets gravity. From there the rocky debris took up positions at libration points  some pieces becoming Trojan asteroids and others Main Belt. However, current theory points to evidence that bodies like 3552 may have been small conglomerates from the solar nebula, unable to form into a larger mass due to Jupiters influence. Like past models, these asteroids collided numerous times from planetary perturbation to become what and where they are today.
. A body in search of a collision on a grand scale. 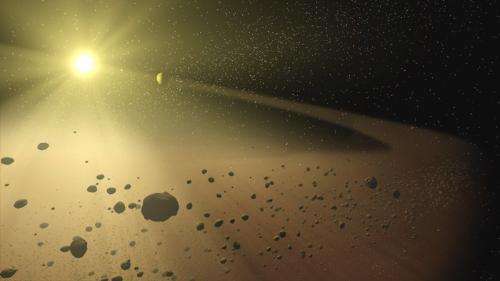 Through the use of theoretical models, the study has found that a percentage of Quixote clones will eventually find their way into the Sun, but with a bit of luck, asteroid 3552 will escape a fiery ending. Asteroid 1983 SA, well known as 3552 Don Quixote, is one of Near Earth Asteroids (NEAs) which is the most probable candidate for the cometary origin, or otherwise as Jupiter-Family-Comets (JFCs). The aim of this study is to investigate the possibility of 3552 Don Quixote to be ejected from the Solar System. This paper presents an orbital evolution of 100 hypothetical asteroids generated by cloning 3552 Don Quixote. Investigation of its orbital evolution is conducted by using the SWIFT subroutine package, where the gravitational perturbations of eight major planets in the Solar System are considered. Over very short time scales (~220 kyr) relative to the Solar System life time (~10 Gyr), the asteroid 3552 Don Quixote gave an example of chaotic motion that can cause asteroid to move outward and may be followed by escaping from the Solar System. Probability of ejection within the 220 kyr time scale is 50%.